Family physician at the Urban Indigenous Health and Healing Cooperative, the Lu’ma Medical Centre, and St Paul’s Hospital in Vancouver, BC, and Clinical Assistant Professor in the Department of Family Practice at the University of British Columbia (UBC). Psychiatrist at the BC Operational Stress Injury Clinic, and with the UBC Hotel Study, and Clinical Assistant Professor in the Department of Psychiatry at UBC. Physiotherapist and wellness coach with the Urban Indigenous Health and Healing Cooperative and a member of the Missanabie Cree First Nation. Member of the Snuneymuxw and Cowichan Nations; a mother of 4 and grandmother to 6 children; Indigenous Elder for the Richmond, Delta, and Burnaby School Districts, as well as for the Indigenous Elder Visiting Program for BC Women’s and Children’s Hospital in Vancouver; Elder Advisor and Research Partner for UBC School of Nursing; and Elder Advisor for the Department of Family Practice at UBC. Full Professor in the School of Nursing at UBC. Objective To determine whether including Indigenous Elders as part of routine primary care improves depressive symptoms and suicidal ideation in Indigenous patients. Design Prospective cohort study with quantitative measures at baseline and 1, 3, and 6 months postintervention, along with emergency department (ED) utilization rates before and after the intervention. Setting Western Canadian inner-city primary care clinic. Participants A total of 45 people who were older than age 18, who self-identified as Indigenous, and who had no previous visits with the clinic-based Indigenous Elders program. Intervention Participants met with an Indigenous Elder as part of individual or group cultural sessions over the 6-month study period. Main outcome measures Changes in depressive symptoms, measured with the PHQ-9 (Patient Health Questionnaire), following Indigenous patients’ encounters with Indigenous Elders. Secondary outcomes included changes in suicide risk (measured with the SBQ-R [Suicidal Behaviors Questionnaire–Revised]) and ED use. Results Characteristics among those who consented to participate were as follows: 71% were female; mean age was 49 years; 31% had attended residential or Indian day school; and 64% had direct experience in the foster care system. At baseline 28 participants had moderate to severe depressive symptoms (PHQ-9 score of ≥ 10). There was a 5-point decrease that was sustained over a 6-month period (P = .001). Fourteen participants had an above-average suicide risk score at baseline (SBQ-R score of ≥ 7), and there was a 2-point decrease in suicide risk that was sustained over a 6-month period (P = .005). For all participants there was a 56% reduction in mental health–related ED visits (80 vs 35) when comparing the 12 months before and after enrolment. Conclusion Encounters with Indigenous Elders, as part of routine primary care, were associated with a clinically and statistically significant reduction in depressive symptoms and suicide risk among Indigenous patients. Emergency department use decreased, which might reduce crisis-oriented mental health care costs. Further expansion and evaluation of the role of Indigenous Elders as part of routine primary care is warranted. Cultural continuity, which relies upon a community’s effort to maintain its cultural institutions and practices, has been identified as a strong community-level protective factor against suicide among Indigenous peoples.25–27 Accordingly, guidelines for Indigenous suicide prevention call for programs that promote pride and control in the community, improve self-esteem and identity, transmit Indigenous knowledge, language and traditions, and employ culturally appropriate methods.28 These elements could be achieved through the meaningful inclusion of Elders in primary care programs. One of the TRC’s “calls to action” involves the inclusion of Elders in the treatment of Indigenous patients in Canadian health care systems.29 However, Elders are not recognized as legitimate care providers within Canada’s health care system, and there are no prospective studies exploring the implementation and effect of formally including Elders in the provision of primary health care. This study’s goal was to examine the effect of an Indigenous Elders program on the mental health of Indigenous patients in an inner-city primary care setting. This study is part of a mixed-methods investigation that followed patients prospectively. The study design was developed in consultation with an Elders and Community Advisory Committee. The study setting was an inner-city primary care clinic that was founded in 1991 to provide medical care to urban Indigenous and non-Indigenous patients. This clinic, described elsewhere in more detail,17 aims to provide interprofessional team-based care that is culturally informed and adapted to the context of the inner-city community. The primary care team is composed of family physicians, nurses, mental health counselors, a psychiatrist, and medical office support staff. The clinic has a panel of more than 4000 active patients, 65% of whom self-identify as Indigenous. Clinic patients are from more than 200 Indigenous communities from across North America. Many patients have serious mental illness, substance use problems, chronic pain, and other stigmatizing health conditions, such as HIV. In 2013, the clinic began a partnership program with a team of Indigenous Elders to provide mentorship to clinical staff and trainees, which expanded in 2014 to provide direct patient care through one-on-one visits, group cultural teaching sessions, and land-based ceremony. Five Elders worked collaboratively with the primary care team, attending shared clinical rounds and using a shared electronic medical record. Between 2014 and 2016, more than 300 clinic patients connected with the Elders program. The target population for this study was adult Indigenous clinic patients who were interested in connecting with an Elder. Inclusion criteria included capacity to provide informed written consent, and no previous visits with the clinic-based Indigenous Elders program. Study participants were recruited from the clinic sequentially over a 12-month period. Demographic and social history data were collected at baseline. The study aim was to measure the mental health effects of patients’ encounters with Indigenous Elders as part of routine primary care. The Patient Health Questionnaire (PHQ-9)30 was used as the primary outcome measure, and was completed by participants at baseline and 1, 3, and 6 months postintervention. Using an α error of .05, a β error of .2, and a loss to follow-up rate of 10%, a sample size of 44 participants was selected to detect a 5-point change on the PHQ-9. Patients with clinically significant depressive symptoms (PHQ-9 score of ≥ 10) were included in the analysis. A score of 10 or higher on the PHQ-9 has been shown to have a sensitivity of 88% and a specificity of 88% for major depressive disorder.30 A per-protocol analysis approach was used—inclusive of all those who had at least 1 visit with an Elder and completed at least the 1-month follow-up. Secondary objectives included measuring changes in suicidal ideation and emergency department (ED) use. Suicide risk was measured using the Suicide Behaviors Questionnaire–Revised (SBQ-R).31 Data on ED use were extracted from patients’ primary care records with data linkages to the regional health authorities’ hospital utilization database. Emergency department visits were categorized into visits related to mental health and visits not related to mental health, and were ranked using the Canadian Triage and Acuity Scale.32 Emergency department utilization rates were compared in the 12 months before and after enrolment. Paired t tests were used to compare means from all outcome measures before and after intervention. We followed the Canadian Tri-Council guidelines on ethical research involving the First Nations, Inuit, and Métis people. The University of British Columbia and the Vancouver Native Health Society granted ethics approval. Forty-five eligible patients with diverse Indigenous backgrounds, representing 14 distinct nations, provided written consent to participate in the study. Baseline demographic characteristics and study measures are described in Table 1. Thirteen percent were from the urban centre where the study was conducted, 43% were from other parts of the province, and 43% were from out of province. Study retention was 91%, with 1 participant dropping out preintervention, 2 moving away before the first follow-up, and 1 death from a chronic illness during the beginning of the study period. 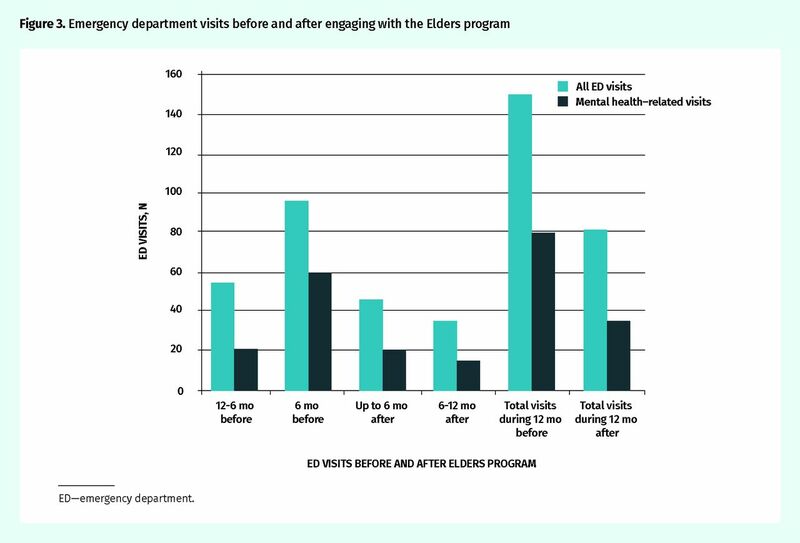 The remaining 41 patients were followed longitudinally over 6 months; the mean number of Elder visits was 5 (range was 1 to 21 visits, median was 3 visits). There was no significant association between the number of visits and study outcomes. As shown in Table 2, 68% of participants had moderate to severe depressive symptoms (PHQ-9 score of ≥ 10) at baseline and 34% had elevated baseline risk of suicide (SBQ-R score of ≥ 7). There was a statistically significant 5-point and 2-point decrease in PHQ-9 and SBQ-R scores, respectively, at 1 month. These statistically significant reductions in depressive symptoms and suicide risk were sustained at the 3- and 6-month follow-up. These changes and their 95% CIs are shown graphically in Figures 1 and 2. Almost 40% (11 of 28) of “depressed” patients (PHQ-9 score of ≥ 10) had a greater than 50% reduction in symptoms. Baseline demographic characteristics and study measures: N = 45. 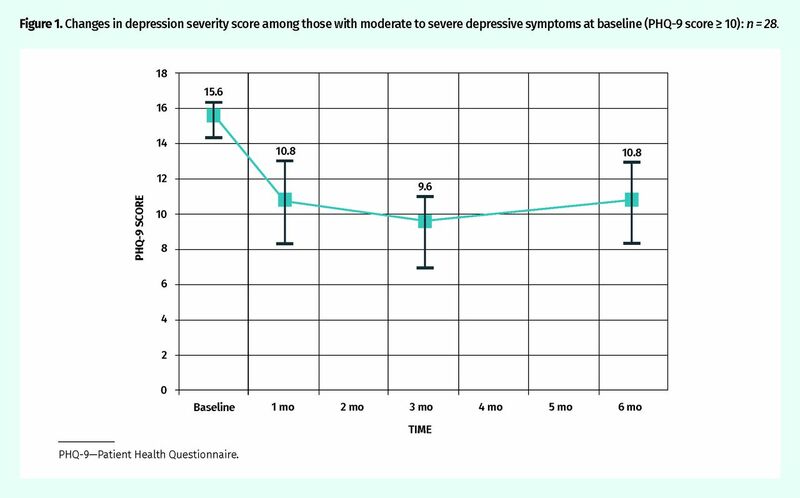 Changes in depression severity score among those with moderate to severe depressive symptoms at baseline (PHQ-9 score 10): n = 28. 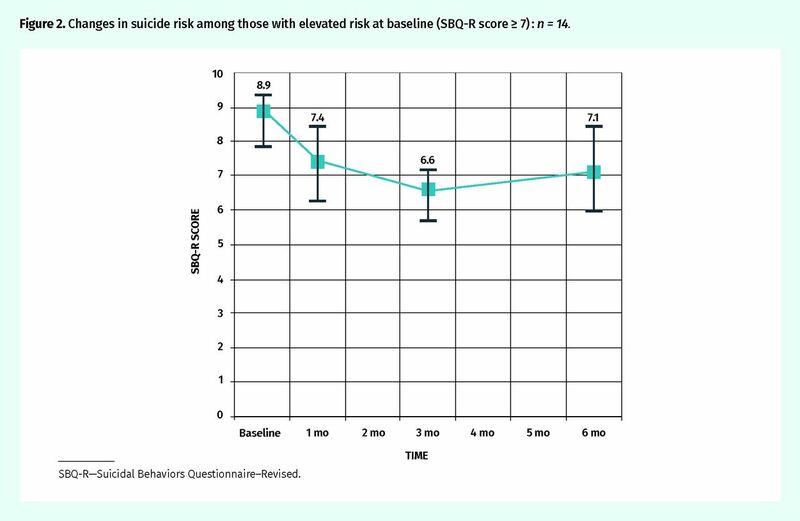 Changes in suicide risk among those with elevated risk at baseline (SBQ-R score 7) : n = 14. Changes in ED use are shown in Figure 3; there was a 46% reduction in total ED visits (150 vs 81) and a 56% reduction in mental health–related ED visits (80 vs 35). Of those visits related to mental health, 97% had Canadian Triage and Acuity Scale scores of 4 (semiurgent) or 5 (nonurgent)—situations often viewed as failures of primary care to prevent a crisis. The mean number of ED visits related to mental health per participant decreased from 1.9 to 0.8 visits per year (P = .11). To our knowledge, this is the first prospective study of Indigenous Elders as part of routine primary care for Indigenous patients. We found clinically and statistically significant sustained reductions in depressive symptoms and suicide risk. Although the study design constrains any claims of causality, analysis of semistructured interviews with 28 of the study participants strongly linked these mental health improvements to their connecting with an Elder.33 Participants described being able to establish trust and openness with the Elders, which they contrasted with their experiences with mainstream mental health providers, and this allowed them to address the negative effects of colonial oppression on their mental health. Encounters with Elders instilled hope as they provided opportunities to strengthen cultural identity and belongingness, and to address the spiritual dimensions that are the underlying source of the depressive symptoms through participation in ceremony. No harms were identified in the qualitative analysis. Our findings suggest that encounters with Elders can provide a meaningful adjunct or alternative to conventional services for Indigenous peoples with emotional distress, including symptoms of severe depression. The observed decrease in ED use could also have considerable cost-saving implications for the health system. The study supports the proposition that Indigenous Elders can play an important role in the mental health of Indigenous people, especially as part of the key process of regaining positive cultural identity and supporting cultural continuity.1 The Elders who provided the intervention in this study chose to participate in order to address the lack of support, respect, and funding for Indigenous Elders in the mainstream health system. They also voiced serious concerns about the cultural appropriateness of having their practice evaluated “scientifically.” The study was designed to evaluate the effect of this cultural intervention on Indigenous patients who were inclined to visit with an Indigenous Elder to address some form of distress or discontent, which in many cases included manifestations of depressive symptoms and suicidal ideation, but it was not designed to specifically evaluate the efficacy of the Elders program for treating depression. Although almost 40% of “depressed” patients had a greater than 50% reduction in symptom severity, the study’s design lacked a control comparator group, which limits speculation on the magnitude of benefit of the intervention. No study participants were excluded based on medical or psychiatric comorbidities, pharmacotherapies, or concurrent substance use disorder, and these other conditions could have influenced the outcomes of this study. The study team accepted these limitations on the recommendation of the study’s Elder and Community Advisory Committee, which expressed that, from an Indigenous perspective, it would be unethical to limit or randomly deny access to patients who wanted to see an Elder. However, the study’s setting within patients’ own primary care clinic and lack of exclusion criteria increases the ecological validity of the findings and their potential application to the real world of inner-city primary care. Further research should attempt to verify this study’s signal of benefit through a randomized, multisite design involving both urban and rural communities. Future studies should also explore the importance of connecting with an Elder from the same versus distinct cultural traditions, and evaluate whether the inclusion of Indigenous Elders in primary care might affect other conditions such as substance use disorder, posttraumatic stress disorder, or chronic pain. This study supports the proposition that the inclusion of Indigenous Elders within mainstream primary health care services can statistically significantly reduce depressive symptoms and suicidality, and contribute to eliminating mental health disparities for Indigenous people. Further, such interventions can potentially lower health care costs by increasing primary care effectiveness and reducing the use of costly emergency and crisis-oriented services. This study’s findings strongly support the TRC call to action to include Indigenous Elders in the treatment of Indigenous patients within the Canadian health care system. The Canadian Institute for Health Research and the Community Action Initiative provided funding for this study. The Vancouver Native Health Society provided material support. ▸ Cultural continuity has been identified as a strong protective factor against suicide among Indigenous people. Suicide programs for Indigenous people should include promoting pride and control in the community, improving self-esteem and identity, transmitting Indigenous traditions, and employing culturally appropriate methods. These elements could be achieved through the meaningful inclusion of Elders into primary care programs. ▸ The findings suggest that encounters with Elders can provide a meaningful adjunct or alternative to conventional services for Indigenous people with emotional distress, including symptoms of severe depression and elevated risk of suicide. The observed decrease in emergency department use could also have considerable cost-saving implications for the health system. ▸ The Elders’ effectiveness at reducing suicidal ideation likely relates to their ability to mobilize known protective factors against suicide, such as promoting a sense of belonging; connecting with family, peers, and community; drawing on spiritual, religious or moral beliefs; and developing a positive identity. ▸ Il a été établi que la continuité culturelle est un solide facteur de protection contre le suicide chez les Autochtones. Les programmes de prévention du suicide chez les Autochtones devraient promouvoir la fierté et le contrôle dans la communauté, améliorer l’estime de soi et l’identité personnelle, favoriser la transmission des traditions autochtones et utiliser des méthodes culturellement appropriées. Ces objectifs pourraient être atteints par une inclusion significative des Aînés autochtones dans les programmes de soins primaires. ▸ Ces constatations laissent entendre que des rencontres avec des Aînés peuvent représenter un complément ou une solution de remplacement intéressants aux services habituels destinés aux Autochtones qui présentent des problèmes de détresse émotionnelle, y compris des symptômes de dépression sévère ou un risque élevé de suicide. La diminution de l’utilisation de l’urgence pourrait aussi entraîner une diminution des coûts pour le système de santé. ▸ La capacité des Aînés de réduire les idées suicidaires dépend probablement de leur capacité de susciter les facteurs connus de protection contre le suicide, comme la promotion d’un sentiment d’appartenance; les liens avec la famille, les pairs et la communauté; l’appui sur les croyances spirituelles, religieuses ou morales; et le développement d’une identité positive. Dr Tu was co–principal investigator and contributed to the development of the research concept and protocol; attainment of funding; implementation of the intervention; data collection; data analysis; and writing and revision of the manuscript. Dr Hadjipavlou was co–principal investigator and contributed to the development of the research concept and protocol; attainment of funding; supervision of research staff; data collection; data analysis; and writing and revision of the manuscript. Mrs Dehoney was a co-investigator and contributed to the development of the research concept and protocol; attainment of funding; data collection; data analysis; and revision of the manuscript. Elder Price was a co-investigator and Elder Advisor, and contributed to the development of the research concept; implementation of the study intervention; data analysis; and revision of the manuscript. Mr Dusdal was a research assistant and contributed to data collection, data analysis, creation of manuscript figures, and revision of the manuscript. Dr Browne was a co-investigator and research mentor, and contributed to the development of the research concept and protocol; attainment of funding; data collection; data analysis; and revision of the manuscript. Dr Varcoe was a co-investigator and research mentor, and contributed to the development of the research concept and protocol; attainment of funding; data collection; data analysis; and revision of the manuscript.
. The mental health of Aboriginal peoples in Canada: transformations of identity and community. In: Kirmayer LJ, Valaskakis G, editors. Healing traditions. The mental health of Aboriginal peoples in Canada. Vancouver, BC: UBC Press; 2009. p. 3-35.
. Suicide among Aboriginal people in Canada. Ottawa, ON: Aboriginal Healing Foundation; 2007.
. The social distribution of distress and well-being in the Canadian Aboriginal population living off reserve. Int Indig Policy J 2011;2(1):5-16.
. Suicidal ideation: the role of economic and Aboriginal cultural status after multivariate adjustment. Can J Psychiatry 2009;54(9):589-95.
. The health of the off-reserve Aboriginal population. Health Rep 2002;13(Suppl):1-17.
. First Nations Regional Longitudinal Health Survey (RHS) 2002/03. Results for adults, youth, and children living in First Nations communities. Ottawa, ON: First Nations Centre; 2005.
. Report of the Royal Commission on Aboriginal Peoples. Ottawa, ON: Royal Commission on Aboriginal Peoples; 1996.
. Healing traditions: culture, community and mental health promotion with Canadian Aboriginal peoples. Australas Psychiatry 2013;11:15-23.
. Trauma and suicide behaviour histories among a Canadian indigenous population: an empirical exploration of the potential role of Canada’s residential school system. Soc Sci Med 2012;74(10):1560-9. Epub 2012 Mar 6.
. Our land, our language: connecting dispossession and health equity in an indigenous context. Can J Nurs Res 2012;44(2):44-63.
. Long-term depression and suicidal ideation outcomes subsequent to emancipation from foster care: pathways to psychiatric risk in the Metis population. Psychiatry Res 2014;215(2):347-54. Epub 2013 Dec 25.
. Indigenous health part 1: determinants and disease patterns. Lancet 2009;374(9683):65-75.
. In search of a healing place: Aboriginal women in Vancouver’s Downtown Eastside. Soc Sci Med 2003;56(4):821-33.
. Narratives of hope and despair in Downtown East Vancouver. In: Kirmayer LJ, Valaskakis G, editors. Healing traditions. The mental health of Aboriginal peoples in Canada. Vancouver, BC: UBC Press; 2009. p. 160-77.
. The role of the Elder within a mainstream addiction and mental health hospital: developing an integrated paradigm. Native Soc Work J 2010;7:87-107.
. Closing the health equity gap: evidence-based strategies for primary health care organizations. Int J Equity Health 2012;11:59.
. ‘Race’ matters: racialization and egalitarian discourses involving Aboriginal people in the Canadian health care context. Ethn Health 2008;13(2):109-27.
. Harm reduction, methadone maintenance treatment and the root causes of health and social inequities: an intersectional lens in the Canadian context. Harm Reduct J 2011;8:17.
. Addressing trauma, violence and pain: research on health services for women at the intersections of history and economics. In: Hankivsky O, editor. Health inequities in Canada: intersectional frameworks and practices. Vancouver, BC: UBC Press; 2011. p. 295-311.
. Working with indigenous elders: an introductory handbook for institution-based and health care professional based on the teachings of Winnipeg-area aboriginal elders and cultural teachings. 3rd ed. Winnipeg, MB: Native Studies Press; 2006.
. What traditional indigenous elders say about cross-cultural mental health training. Explore (NY) 2009;5(1):20-9.
. Cultural continuity as a hedge against suicide. Transcult Psychiatry 1998;35(2):191-219.
. Cultural continuity as a moderator of suicide risk among Canada’s First Nations. In: Kirmayer LJ, Valaskakis G, editors. Healing traditions. The mental health of Aboriginal peoples in Canada. Vancouver, BC: UBC Press; 2009. p. 221-48.
. Perspectives on Aboriginal suicide: movement toward healing. In: Menzies P, Lavallée LF, editors. Journey to healing. Aboriginal people with addiction and mental health issues. What health, social service and justice workers need to know. Toronto, ON: Centre for Addiction and Mental Health; 2014. p. 285-300. Acting on what we know. Preventing youth suicide in First Nations. The report of the Advisory Group on Suicide Prevention. Ottawa, ON: Government of Canada; 2002. Available from: www.canada.ca/content/dam/hc-sc/migration/hc-sc/fniah-spnia/alt_formats/fnihb-dgspni/pdf/pubs/suicide/prev_youth-jeunes-eng.pdf. Accessed 2017 Oct 20. Truth and Reconciliation Commission of Canada: calls to action. Winnipeg, MB: Truth and Reconciliation Commission of Canada; 2015. Available from: https://nctr.ca/assets/reports/Calls_to_Action_English2.pdf. Accessed 2019 Feb 27.
. The Suicidal Behaviors Questionnaire–Revised (SBQ-R): validation with clinical and nonclinical samples. Assessment 2001;8(4):443-54. Implementation guidelines for the Canadian Triage and Acuity Scale (CTAS). Ottawa, ON: Canadian Association of Emergency Physicians; 1998. Version CTAS16.DOC.
. “All my relations”: experiences and perceptions of Indigenous patients connecting with Indigenous Elders in an inner city primary care partnership for mental health and well-being. CMAJ 2018;190(20):E608-15.
. Suicidal ideation among Métis adult men and women—associated risk and protective factors: findings from a nationally representative survey. Int J Circumpolar Health 2012;71:18829.
. Mental health programs for American Indians: their logic, structure and function. Am Indian Alsk Native Ment Health Res Monogr Ser 1990;3:1-279.